Learn about new and interesting foods and beverages that I see in stores, restaurants, and trade shows. Coffee Fest hosted its eighth Chicago trade show from June 9-11, 2017 at Chicago’s Navy Pier. The organizers focused on cold brew coffee at this year's show with the addition of Cold Brew U and America’s Best Cold Brew Competition. The emphasis on cold brew coffee is not surprising as cold brew coffee is one of the fastest growing segments in U.S. beverages in retail and foodservice channels. The cold brew sub-segment of the U.S. RTD (ready-to-drink) coffee market was projected to grow by 580% from 2011-2016 in retail channels according to market researcher Mintel in July 2016. On the foodservice end, sales of chilled coffee beverages (which include iced coffee, cold brew, and nitro) at Starbucks have grown about 25 percent annually since its summer 2015 launch of cold brew coffee in U.S. stores. The Cold Brew U workshop offered attendees a two-hour lesson on all things cold brew coffee with speakers from Friedrichs Coffee (a specialty coffee roaster and coffee shop chain in Des Moines, Iowa), Brewista (a manufacturer of coffee and tea brewing devices), and Micro Matic (a manufacturer of draft beer dispensing systems and kegerators). Malia Meyer from Friedrichs Coffee cleared up misconceptions about cold brew coffee by stating that cold brew coffee is not iced coffee; cold, brewed coffee; not nitro coffee (necessarily); and not bottled coffee (necessarily). She then presented a history of cold brew coffee going back to the early 1600s when the Dutch East India Company traders developed a method to brew coffee that did not require hot water on ships to the 1964 patent for the Toddy Cold Brew system by Todd Simpson. Christian Krause from Brewista talked about the benefits of cold brew coffee including its lower acid content than hot brewed coffee, making it easier on the stomach and less damaging to teeth. He said that marketing cold brew coffee has become easier because Starbucks and Dunkin Donuts have spent millions creating awareness of cold brew. Dunkin Donuts introduced cold brew coffee to their stores in August 2016. Bryan Nelson from Micro Matic presented on nitrogenated coffee by explaining the nitrogenation process, equipment considerations, and the importance of food safety. Who Makes the Best Cold Brew Coffee? America’s Best Cold Brew Competition featured 32 competitors divided into still and nitro categories over three days. All attendees were allowed to participate in the judging process. The winners were Chicago’s Hellion Cold Brew (who work with Chicago coffee shop Metric Coffee) in the still category and Milwaukee, Wisconsin’s Colectivo Coffee (who partnered with 3 Sheeps Brewing) in the nitro category. Nitro coffee is still a niche offering in the U.S. with no publicly available estimates on the size of the category. However, if Starbucks and equipment manufacturers at Coffee Fest Chicago get their way, Americans will be drinking a lot more nitro coffee in the next few years. Nitro coffee is cold brew coffee that has been infused with nitrogen to create a smooth, creamy taste with a foamy head similar to a Guinness. Coffee drinkers have responded positively to nitro coffee because of its naturally sweet, creamy taste and visual appeal. However, few consumers in the U.S. had tasted nitro coffee prior to summer 2016 when Starbucks introduced it in about 500 U.S. stores. Nitro coffee's availability had previously been limited with few coffee shops offering it. Portland, Oregon's Stumptown Coffee Roasters helped to popularize nitro coffee by introducing nitro coffee on taps in its stores in 2013, creating a RTD version in cans in 2015, and shipping kegs of nitro coffee to specialty coffee shops. Starbucks aims to be an even bigger player in nitro coffee. On July 13, 2017,Starbucks announced that it would expand the number of stores offering nitrocold brew from nearly 1,000 stores in the U.S. to about 1,400 stores by the endof 2017. However, due to space limitations, the special equipment and accompanying kegs for nitro cold brew coffee may not become available in all Starbucks stores, according to Sandy Stark, senior vice president for U.S. beverage and global innovation. 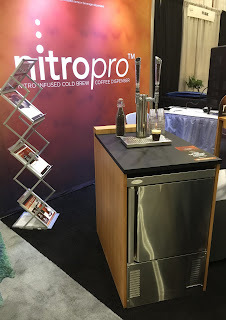 Nitro equipment manufacturers in attendance at the show included Micro Matic, Bunn-O-Matic Corporation, and Cornelius, Inc. Micro Matic exhibited with partner JoeTap, Inc who developed the nitro infusion technology for coffee. To attract attendees to the booth, Micro Matic offered personalized nitro coffees including nitro selfies through the use of the Ripple Maker that prints an image or text onto the coffee foam with coffee extract “ink”. As nitro coffee gains popularity, equipment makers are trying to make it easier for coffee shops and restaurants to add nitro coffee. While the first generation of nitro equipment required changing out heavy metal kegs and using nitrogen tanks, the new generation of machines take up less counter space, provide more volume, and in some cases can generate its own nitrogen. All of these companies offered options that use a BIB (bag-in-box) coffee concentrate to mix the coffee concentrate with filtered water and infuse it with nitrogen. Using BIBs to serve nitro cold brew is similar to using soda syrup in soft drink fountain machines. The water to concentrate ratio for a cold brew coffee BIB can range from 3:1 to 20:1. Bunn, a maker of coffee machines, showed its Nitron Cold Draft machine with two taps (one for nitro, one for still cold brew) in a slim 10” footprint. Cornelius, known for its fountain soda dispensers, introduced the NitroPro (with three taps) and NitroPro BIB (with two taps) coffee dispensers. At the booth, Cornelius showed IDEX’s Element 7 nitrogen gas generator to offer an option for coffee shops that do not want to use nitrogen tanks. Micro Matic showed the JoeTap Barista (with two taps) countertop model that has an on-board nitrogen generator. Despite the high cost and counter space required for nitro coffee dispensers, demand for nitro coffee is likely to grow strongly because nitro coffee addresses consumer desire for indulgence, health, clean labels, and energy. Nitro coffee offers a sweet, creamy taste with minimal calories and no added sweeteners; the use of only two ingredients coffee and water; as well as offering a caffeine boost without the artificial ingredients found in standard colas and energy drinks. The creamy mouthfeel of nitro coffee also lends itself to consumption as an afternoon snack or dessert substitute. A number of exhibitors used cold brew coffee as a base for coffee drinks. At the Kerry Foodservice booth, they offered samples of Cold Brew Siesta prepared with Big Train Horchata Drink Mix, cold brew. and ice. Levi Andersen, Beverage Product Specialist for Kerry and creator of AudioCafePodcast.com said that “cold brew will be around for a long time” when I asked about future prospects. On the topic of nitro cold brew, he said that it is harder to set up, expensive, and needs counter space. At the Drink Innovations Lab, Andrea Ramirez, Customer Marketing Manager for Torani, taught attendees how to make Irish Coffee Soda with Torani Signature Irish Cream Syrup, cold brew, sparkling water, and topped with whipped cream. Coffee Fest's next show is scheduled to take place in Portland, Oregon from October 13-15, 2017. Virgina, great food article. RFS Rose Fanta Search is a Food and CPG Recruiter for the consumer packaged goods industry. We are a food and CPG recruiting firm that recruits food manufacturing and consumer packaged goods applicants for CPG jobs and food manufacturing jobs. Yes i am totally agreed with this article and i just want say that this article is very nice and very informative article.I will make sure to be reading your blog more. You made a good point but I can't help but wonder, what about the other side? !!!!!!THANKS!!!!!! Avengers Infinity War.